You will notice that, during the Holy Sacrifice of the Mass, while the choir chants the Agnus Dei, the priest will break the Host into three pieces. Two parts are left upon the paten, while one part (which is very small) is placed into the chalice of the Precious Blood. This is called the rite of “commingling”, because it is at this point that the Body and Blood of Christ are sacramentally mingled together – though the Lord is fully present in both the Host and the chalice, the one is the Sacrament of his Body and the other is the Sacrament of his Blood. 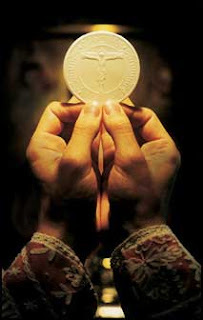 As the priest performs this rite he prays: “May this mingling of the Body and Blood of our Lord Jesus Christ bring eternal life to us who receive it.” There is, in the very rite itself, a direct connection between the commingling and salvation! St. Thomas Aquinas, following an ancient tradition, has shown how the whole Church is mystically present in this sacramental rite. Here, hidden in the rite of the Mass, we find a symbol of our two feast days – All Saints’ and All Souls’. The blessed, especially Jesus and Mary who enjoy heaven even in their proper bodies, are symbolized by the very small portion of the Host which is mingled with the Precious Blood. Just as the Blood completely saturates the Sacred Host, the blessed are filled and inebriated with the glories of heaven. The prayer of commingling speaks of the eternal life which all the saints now possess – a glory which will be brought to fulfillment in the general resurrection. St. Thomas finds that the Church on earth is symbolized by the remaining two parts of the Host which are consumed and also by the entire Sacrament which is distributed to the people during communion. Just as these Hosts are broken and dispersed and consumed, so too the Church militant suffers and struggles and is persecuted for her faith. Moreover, it is particularly fitting that the Sacrament which is consumed should symbolize those who consume It – that is, the members of the Church on earth! Finally, we might wonder where the Holy Souls fit into this allegory. St. Thomas finds them in that portion of the Blessed Sacrament which is reserved in the tabernacle – actually, he refers to an old tradition of leaving a portion of the Sacrament upon the altar until the conclusion of Mass (a practice which had ceased even by his time). These Hosts which are kept in the tabernacle are in a place of waiting; yet they do not suffer the temptations and persecutions of the world. Thus, it is particularly fitting that the reserved Sacrament should symbolize the souls in purgatory. What is kept, those at rest. Cf. Summa Theologica III, q.83, a.5, ad 8.